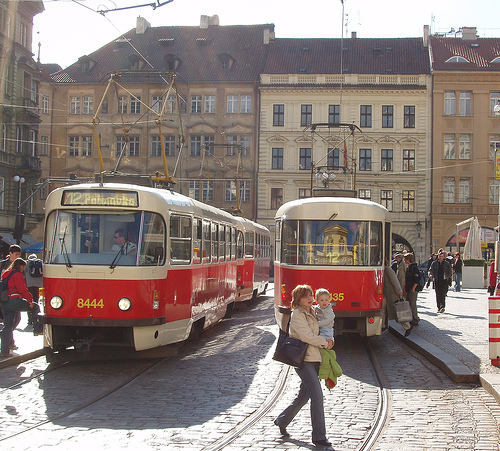 Prague, Czech Republic, has one of the best public transit systems in all of Europe. Its size makes it easily navigable, and there is excellent infrastructure. If you move there, it does not take too long to get used to the routes. The payment system works as an honor system. Inspectors can come out of nowhere and hit you up for your pass. They’ll often go after people who are speaking English or other languages that are obviously not Czech. Ticket prices are reasonable (a single pass is a little less than a dollar), and you get great deals if you are a student in Prague, between the ages 15-26 (under $40 for three months). The Prague Metro gets you to many of the main points of interest around the city, such as around Old Town Square and Wenceslas Square, or to Dejvická, where you can transfer to buses that take you to the airport. It is easy to use because it is simple and only has three lines (they are planning to build more). The lines are the Red, that run North and South from Letňany to Háje; the Yellow that runs East to West from Černý most to Zličí; and the Green that runs from Depo Hostivař to Dejvická. 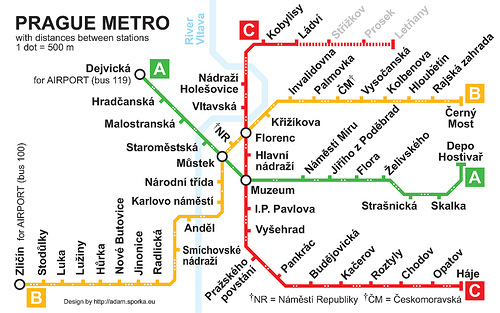 The Prague Metro carries about 400 million passengers a year. It is clean, fast and efficient. It is only about 30 years old. The trains run every 2-3 minutes during peak hours, and every 4-minutes off-peak. They stations are very far underground, and you have to take really steep escalators to get down there. They run from 5 AM until midnight. 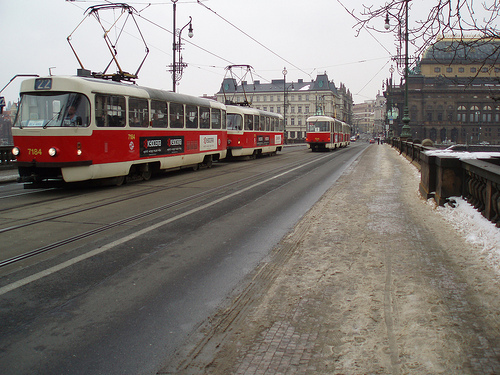 The trams (tramvaje) of Prague are great because they are 24 hours. Pay attention though, because the numbers and the routes of the night trams are different from the day ones. The day trams run every 8-10 minutes. The night trams run every forty minutes. Night trams get pretty crowded and crazy with all of the partiers that enjoy Prague’s happening nightlife. Prague’s trams reach out to almost all areas of the close-in city, with over 500 kilometers of tracks, and are used by about 300 million passengers a year. Since they are above ground, they sometimes will face some delays due to heavy traffic. The buses are mostly meant for the outskirts of Prague that can’t be reached on trams or metros, or some awkward residential parts of the city. 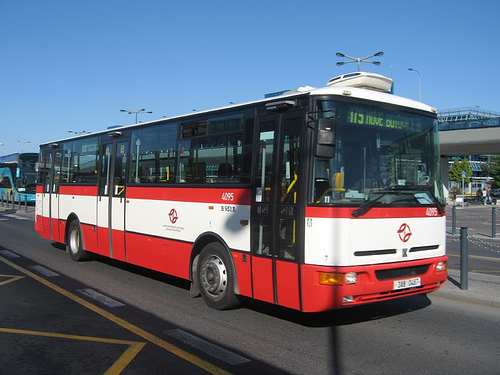 You can take the buses to see some of the less romantic, socialist architecture of the city. Buses are also 24 hours. Daytime buses run every 6-8 minutes during peak hours, 10-20 minutes in non-peak hours, and 15-30 minutes on the weekends. Nighttime buses only run every 30-60 minutes.